One of the 'seven sisters' that dominated the oil industry for much of the last century. With activity in 180 countries and frequently featured as one of the top 20 companies in the world, they obviously have a large workforce. Currently, Chevron employs just under 52,000 people, with roughly half in the USA. The recent oil crash that started in 2014 affected Chevron, just like it did most oil companies. 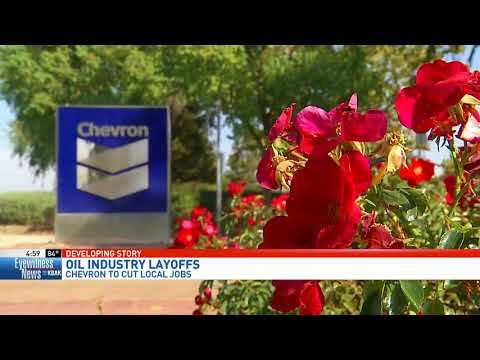 In October 2015, Chevron cut 500 jobs in the San Fransisco Bay Area, (430 in San Ramon and 70 in Richmond). The company issued guidance that it planned to cut around 8000 staff between 2015 and 2016. According to 10-K SEC filings, in 2016, Chevron shed 6,300 of its worldwide employees, bringing the total down to 55,200. During the same period, the company posted losses of around half a billion dollars. In October 2017, Chevron announced that they would cut 26% of their local workforce in Bakersfield California. Here's a news clip from Eyewitness News in Bakersfield. This was published on the 19th of October 2017, the same day of the announcement. This meant that around 300 jobs would be either lost or re-assigned within the company. The majority from a restructuring process in the San Joaquin Valley Business Unit. The employees in this business unit are part of the upstream sector of the industry. This was the sector most affected in the crash and that lead to back to back losses amounting to six billion for the global upstream division overall. These workforce adjustments are still in process at the time of writing, for example, some lost their jobs in January, and 100 workers got permanently laid off last week.